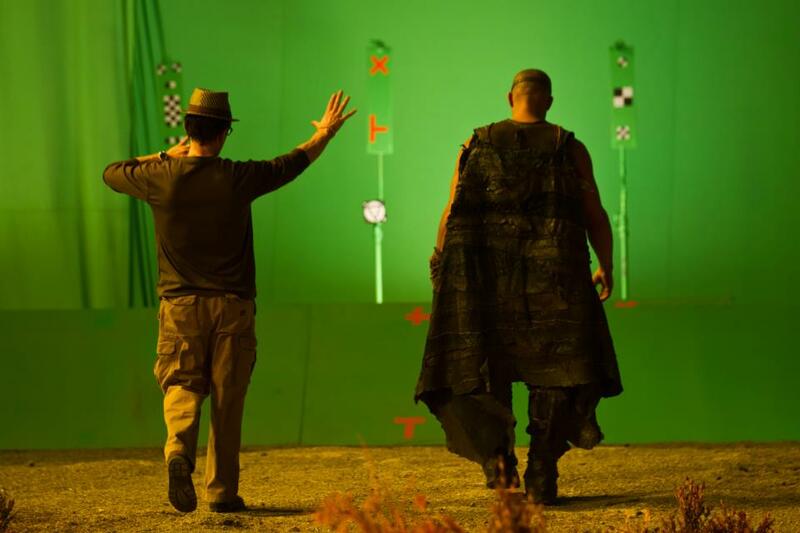 The awesome Vin Diesel took to his Facebook again and shared this cool green screen shot from RIDDICK. Riddick also sees the return of Karl Urban (Star Trek, The Bourne Supremacy) as Vaako and introduces to the series Jordi Molla (Bad Boys II, Colombiana) as Santana, the arrogant captain of the mercenary ship; Matt Nable (Killer Elite) as Boss Johns, a man looking for answers; Katee Sackhoff (TV's Battlestar Galactica) as the Nordic mercenary Dahl; and Bokeem Woodbine (upcoming Total Recall) as bounty hunter Moss. Rounding out the cast are Dave Bautista (The Scorpion King 3: Battle for Redemption), Conrad Pla (Immortals), Raoul Trujillo (Apocalypto), Nolan Funk (TV's Aliens in America) and two-time Grammy Award-nominated singer Keri Hilson. Betrayed by his own kind and left for dead on a desolate planet, Riddick (Diesel) fights forsurvival against alien predators and becomes more powerful and dangerous than ever before. Soon bounty hunters from throughout the galaxy descend on Riddick only to find themselves pawns in his greater scheme for revenge. With his enemies right where he wants them, Riddick unleashes a vicious attack of vengeance before returning to his home planet of Furya to save it from destruction. Here's another new image of director David Twohy and Diesel on set.